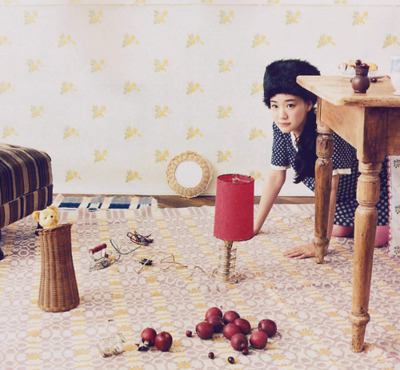 Japan's poster girl of the Mori Girl movement is undoubtedly Yū Aoi 蒼井優. An actress/ model most famous for her role as Kimiko Tanigawa in the film Hula Girls フラガール, she solidfied her image as a Mori Girl idol when she was cast as Hagumi Hanamoto in the movie adaptation of cult Mori Girl manga Honey & Clover ハチミツとクローバー. She embodies that 'awkward gamine' look perfectly-- ungroomed natural beauty, childlike features, sometimes boyish and usually dressed like a doll in billowy silhouettes and oversized cardigans. Here's a little selection of Yū Aoi photoshoots, she is often shot doing your typical Mori Girl activities.... travelling, reading, daydreaming...eating pancakes.